If you require need-based financial, you should hunt for schools that are generous with their aid packages. This is the advice that I shared in my last college blog post: Where Is the Financial Aid Cash? If you didn’t read it, I’d suggest that you do before continuing on with this post. If money is an issue, students should be aiming for schools that will meet a higher percentage of their financial need. One site where you can gather this information for individual institutions is at the College Board. 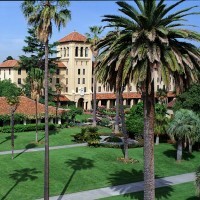 I’m using Santa Clara University in California as an example. 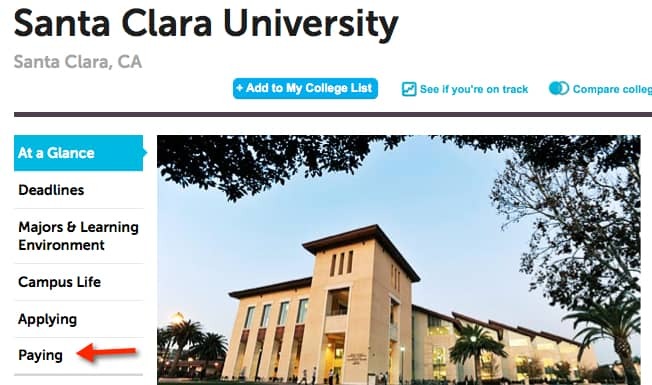 I picked Santa Clara U. because it happens to be on the federal government’s hall of shame list. It is in the top 5% of four-year schools with the highest net price (cost minus typical scholarships). On the College Board home page, type in the name of any school and its profile page will show up. To access the school’s financial aid statistics click on the school’s Paying link. Once you click on that link, you will see the school’s sticker price. What I find curious about Santa Clara’s numbers is that it doesn’t include some of the expenses college students will incur such as transportation and books. 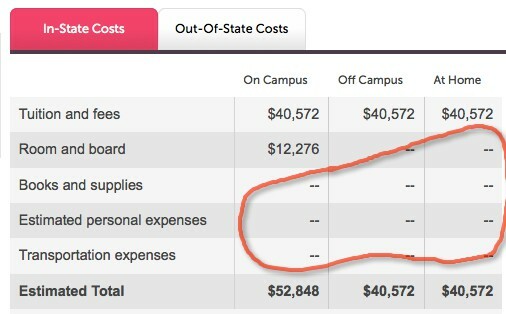 Also curious is that the school didn’t include any room and board costs for students who live off campus. The cost to rent an apartment in the Silicon Valley will be high. I can only assume that the university wants to appear less expensive than it is. While you’re on a college’s cost page, look up at the top and click on the Financial Aid By the Numbers link. This is where the numbers start getting interesting. Sadly, this Jesuit university, like many Catholic universities that I have researched, meet a low percentage of need for its students. It typically meets 73% of need and that figure will usually include a loan. The closer this number is to 100%, the better the deal for a student. At nearby Stanford University, which is admittedly a much richer school, the average students do get 100% of their need met. A middle-class or poor student who receives such low financial support would graduate with a ton of debt. I would not recommend this school to someone who needs a lot of financial help. By the way, I don’t put much stock in the pie charts that I see on the College Board; they often seem out of whack with the numbers. Also, I’ve put an “x” by the other statistic which I find to be wrong for all schools. This is a College Board glitch that I believe surfaced when the organization redesigned its website last year. In the chart below you’ll find what percentage of students applied for aid (67%) and how many were judged to have need (78%). Ideally all the students who need help will receive it, but that’s not the case at Santa Clara. Seventy eight percent of those who applied for aid were judged to qualify for help, but only 67% of students received any. What is really important, and illuminating, is what percentage of students had their full need met. At this school, the figure is 24%. On the right hand side, you’ll see that Santa Clara’s average need-based scholarship or grant is $19,450, which is low for a school that costs more than $52,000. For families that won’t qualify for need-based aid, however, the average merit scholarship (non-need-based aid) is $10,357. The average indebtedness of a student who borrows at Santa Clara U. ($28,672) isn’t much above the average of $26,000 or so. I’m not sure what to make of this. The figure could be wrong. I see a lot of figures on the College Board that look strange. Or many of the students at this school are wealthy enough that they don’t have to borrow heavily. Often I see the average indebtedness figure left blank at schools with lousy financial aid. 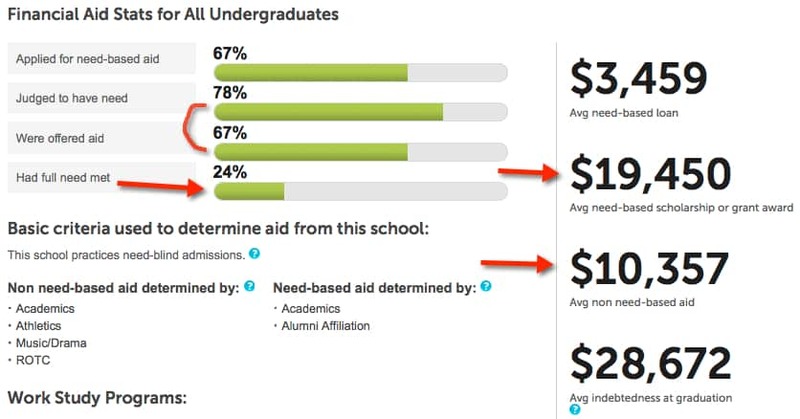 Unlike Santa Clara, some schools with dreadful financial aid such as New York University, Pratt Institute and Drexel University don’t have ANY financial aid data on the College Board site. Shame on them! In my next post, I will return to the College Board and show you statistics of a school that is generous with its students. Where’s the Financial Aid Cash? 12 Responses to Is This University Stingy? This is very useful information to keep in mind when looking at schools, Thanks Lynn. My child is a Senior, and my child also applied at Santa Clara early action. My child received the FA info online in Dec. We had to fill out the CSS. Santa Clara offered my child the lowest amount of scholarship, and all schools offered a 5,500 Federal Direct Unsubsidized Loan. We have a high EFC, and were not expecting any assistance. Just hoping for merit scholarships. If $$ is a concern, and your child has done well extremely well academically in school AND outside of school– do your research and look for school that offer full merit scholarships. My child was offered interviews for 4 of the 9 schools (1 school was our state university) for a full merit scholarship. My child went to 3 interviews and received 1. Know that grades and SAT is not the ONLY deciding factor for these awards. The schools looked at my child’s, academic and community service awards, athletic achievement, leadership at school and in the community, community service as well as global community involvement, musical talents, youth group leadership, and my child did a internship in his/her job interest, on top of all of this. My child and 1 parent had to fly to these schools (3 times) to interview for a weekend at a cost of $1,000 per weekend. to reach his/her goals in college. That was the first priority, and then I looked for full-tuition merit scholarships, volunteer scholarships (1 school offered a 3/4 tuition one). And I was surprised because I didn’t think my child qualified for 1 school’s full tuition scholarship, and 1 school I didn’t even know they had one- so that was a nice surprise! My child applied early, and so my child also received merit scholarships early as well as invites to compete for the full-tuition scholarships. What an ordeal! Some of those scholarships required essays for the application, 1 required an essay after the interview…and my child had to do all of this while playing a varsity sport and taking 4 AP classes+ a language, and doing performing arts! The point of all of this??? It was a LOT of work looking for the right colleges, but for us in the end- we found a PERFECT FIT for my child, financially, socially, mentally, EVERYTHING!!!! We are grateful…it was well worth the effort. Finally, thanks to Lynn for her sage advice! And for the website recommendations I used to do my research! Congratulations to your child and you! Your child accomplished, beautifully, all the checklist items to which we parents want all our kids to aspire. May I ask which tool(s) you found most useful in finding schools that offer full merit scholarships? There are so many tools out there, it seems. May I also ask what what area(s) of study your child was interested in, and if your child applied to any state universities? With 24% getting their need fully met and the average percentage of need at only 73%, there is a great deal of variability. I would speculate that this is due to Santa Clara using CSS/PROFILE as the basis of determining financial aid awards. CSS has more variables than FAFSA to plug into the formula, most notably home equity. So how can you tell if you are in the lucky 24% or someone who will get far less than 100% of need met? This is where the net price calculator comes into play. I don’t know why the comments are closed. I’ll try to figure it out. Thanks for letting me know Denise! An excellent site where you can get better borrower information is from the Project on Student Debt. The site will provide average indebtedness per student borrower per school, the percentage that took out loans and the percentage of student debt that came from non-Federal sources, aka private bank loans. For Santa Clara less than half of 2011 grads borrowed, according to this source. But more than a third of the debt was non-Federal meaning lots of student debt here was private. 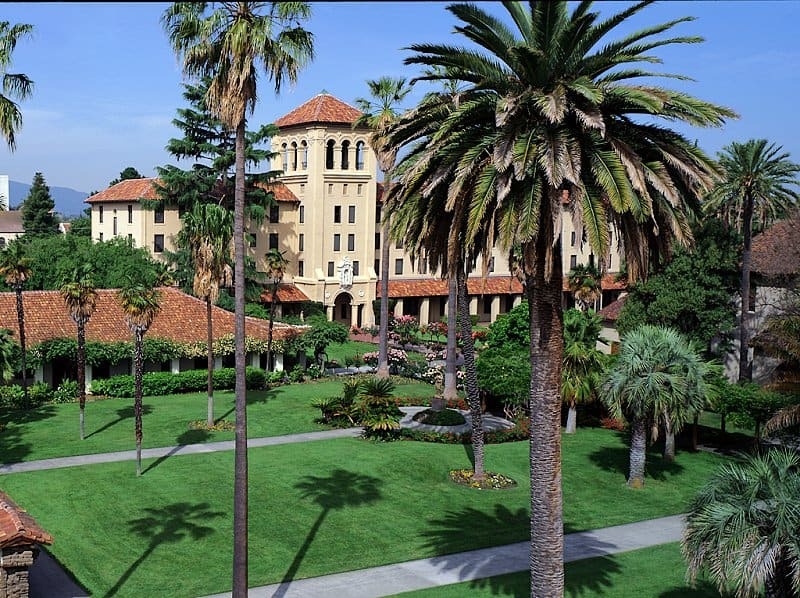 Even if their average of $27,000 sounds low, it’s fair to believe that many Santa Clara students did not receive or qualify for Perkins or Stafford loans. “Sadly, this Jesuit university, like many Catholic universities that I have researched, meet a low percentage of need for its students.” Interesting. Are you implying this is characteristic of Catholic higher education as opposed to what? Historically, Catholic colleges lack the impressive endowments their counterparts. Brian — There are lots of stingy schools, but the Catholic universities are right in there with a few exceptions such as Notre Dame and Georgetown. Catholic universities typically give out merit aid to rich students, but their aid to low and middle-income students is often poor. And I’m saying that as someone who was educated in Catholic schools like the rest of my siblings and my father. The average indebtedness of students is usually the Federal loan number. So, that means nearly every college skips talking about private loans the student may have. Also, the PLUS (parent loans for undergraduate students) are typically left out of this data. You’re correct in thinking the number colleges report is not realistic! Thanks Lynn. This is very timely as I was just helping a family research these exact numbers. What website would you recommend as an alternative to College Board for need met and other financial aid statistics? Another site that I like is COLLEGEdata.com.